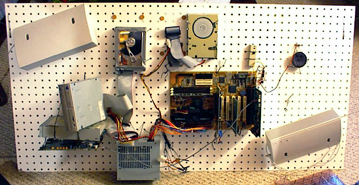 Pegboard Computer: Part ummm... five? 5.5 is at the bottom! As usual I was thinking of stuff to add to the PbC, this time it was reeeally easy to figure out what the new addition would be. A new video card (Gainward GeForce2 MX) had been purchased for the PIII 450, replacing the Voodoo3 2000 that had been in there and thus freeing this card for other uses (like mine). In addition to that I found out that the hardware store sells and cuts sheets of Lexan. Separately these seem to be, well, separate. What you don't know is that I also have an extra motherboard (Abit BE-6) and an extra processor (PIII 550). So logically I put the 550 in the 450, took the 450 and put it on the board that had contained until this instant the 550. Of course when I speak of instants I don't literally mean right this instant, if I meant that it would mean that you are reading what I type in real-time or that I was lying. Since I'm an Eagle Scout and obviously you aren't watching me make typos and quickly correct them every 42 seconds (I say 42 because that is the answer to everything and therefor how often I make errors) I must conclude that you are lying about something. But enough about that, I am (or was when I typed this) talking about a big upgrade for the pegboard! So, I took the board off the wall and set to work removing everything that I spent hours putting on not all that long ago. 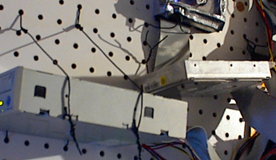 After about 15min pulling stuff off, I decided it would be a good time to place objects back on the pegboard. Since I have so much experience with tying objects to the little holes in the board this was accomplished in about 42 seconds (give or take...). 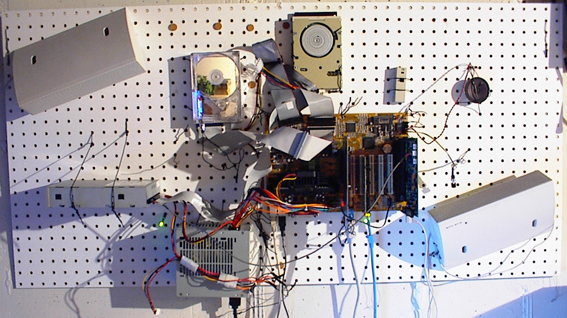 With the help of two stout men manning the block and tackle we wrestled the computer back into its place on the basement wall. At this point I waved my hand and spawned a 15" HP monitor (with stand) below the PbC on the desk. Neat, huh? 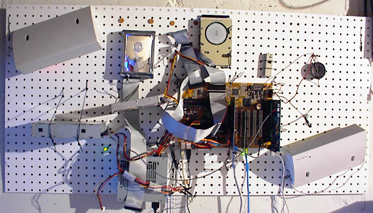 As a final touch I removed the old CD-ROM and installed the HP CD burner I had been playing with in its place. On first boot I got to watch in wonderment as Win98 actually found most of the drivers for the new parts on its own. Sometimes it just plain surprises me... 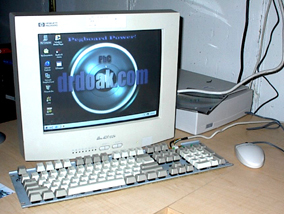 I popped on out to the web and retrieved drivers from the now defunct 3DFx. The only other piece of hardware that I added at this time was a Win TV card which is made by Hauppage (not sure if that is pictured or not). You may now look at some pictures of all this stuff. 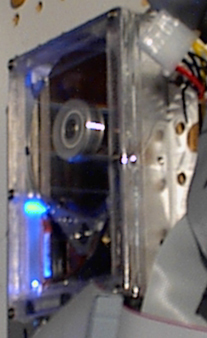 The next thing I did was build a Lexan shield for the HDD to replace the duct tape and jewel case window that was currently protecting the HDD. I did this by making Sears Hardware cut strips of Lexan sheeting to the right lengths and then gluing them together with "Amazing Goop." I then let the Goop (which causes cancer in CA, so it's best not to use it there) set overnight for maximum bond strength (which is about 24 hours longer than I have patience for). Anyway, I used a Sears drill press to boldly drill multiple small openings at strategic positions in the Lexan lid. When this was done (surprisingly without melting the Lexan) I decided to implement a bold strategy of systematized incremental removal of plastic from the edges of the object in order to create a more refined product. In other words I took a grinding wheel to it. Again the Lexan didn't melt, totally amazing me (since I have only worked with soft plastic before). 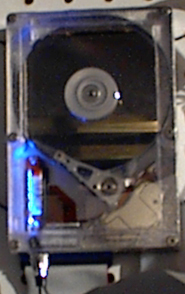 I even found long screws that fit the HDD so I could fit the lid on without tape, a new concept for me... After the lid was tightened, I took some foil tape (which looks cool) and sealed the HDD with it (so it would look cool). Along the way I inserted the blue LED again. Time to look at more pictures!!! A week later disaster struck, the controller card on the HDD cut out. If I wasn't using the computer the next day for a LAN party it wouldn't have been so bad, but I was and it was. The #%&@*!$ thing just kept slamming the armature back and forth against the stops. Some people think Zip drives have a click of death, but let me tell you, they don't know a thing about deadly clicks... I ran out to CompUSA and bought a new Western Digital 30GB (I had to restrain my better judgment to favor this unit) drive for one penny more than the 20GB drive, go figure... So I ended up with six times the storage and a magic see-through clicking HDD from this ordeal... At the super caffeine LAN party the PbC performed flawlessly by playing Serious Sam, Quake III, No One Lives Forever, Soldier of Fortune, and Elite Force. 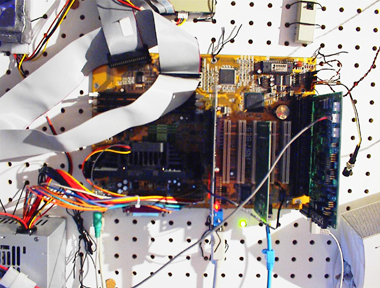 Just recently I added another 128MB of RAM to the 64 I had put in originally so its up to 192MB now. The second thing I did involves the monitor. The PbCs monitor has been doing some freaky things lately like blinking and shutting off at random intervals. After conferring with a bunch of random people named Jeremy we came to the conclusion that the problems must be heat related. I wasn't sure how to feel, I love fans and placing them all over the case, but I also worry that my monitor will die suddenly. You quickly grow used to having dual monitors (especially if they are attached to two different computers doing two different things). Anyway, I went out to MicroCenter to buy some fans form the monitor. Instead of cutting holes in the side of the thing I decided on a bracket with two medium sized fans. Together they move around 60 cubic feet a minute. 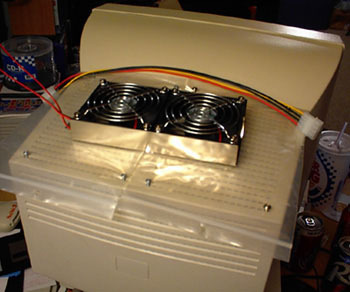 I placed the fans on top and used plastic bags to block any other airflow through the top vents. Today, no flickering, blinking, winking, flashing, or random losses of picture. I would suggest everyone consider placing some kind of a fan up there since it will most likely lengthen the lifespan of your monitor. Is there a Part 6? YOU BETCHA!! !